Get married at the best kept secret of Mexican Caribbean. Imagine the best day of your life in the magic beach of Holbox Island. Let Villas Delfines deal with every detail of your event. 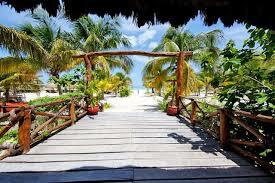 The Hotel Villas Delfines is located on the best beach on Isla Holbox. Are you planning on a unique wedding? Do you want warm temperatures and sun for your special day? Do you want to say "yes" to your soul mate while the sun sets into the sea and then celebrate with family and friends? Villas Delfines will organize your wedding and ensure the day is unforgettable. Contact us and tell us your wishes and desires. With pleasure we will advise you and provide original ideas.